Prosecco is easily Italy’s most popular sparkling wine and Tenuta Sant’Anna Prosecco Extra Dry is one of the best out there. Light, refreshingly effervescent and well-priced, Prosecco is a popular before-dinner drink (aperitivo), not only in the Veneto region in northeastern Italy – which is Prosecco’s traditional home – but throughout the length and width of the country. While delicious on its own, Prosecco can also be served throughout the meal especially with seafood and shellfish, light salads, tempura and sushi. Lastly, it can be combined with white peach nectar to make a Bellini, Venice’s most famous cocktail, or mixed with lemon sorbet to create a frothy, sweet after-dinner drink called a ‘Sgroppino‘. Delicious! 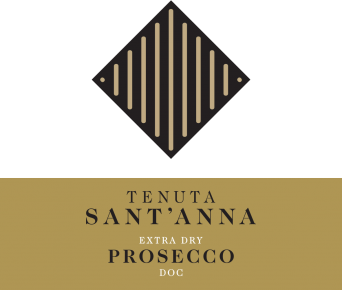 Tenuta Sant’Anna Prosecco Extra Dry is made with 100% estate-owned Glera grapes, formerly known also as Prosecco. In 2009, Italian authorities implemented some significant changes designed to boost quality as well as protect the territorial integrity of the Prosecco name. This was made necessary because Prosecco’s popularity around the world had triggered a frenzy “counterfeit” Prosecco offerings from other regions as far away as Australia. It was decided that only wines produced from Glera (the grape’s historic name in the local area) grown in the Prosecco DOC and DOCG zones can be called ‘Prosecco’. Prosecco styles vary based on the amount of residual sugar and can range from brut (dry) to extra dry (which counter-intuitively means a little bit sweet). While this is by no means a sweet wine, that light touch of sweetness makes Tenuta Sant’Anna Prosecco especially pleasant to the taste, initially cool and soft on the palate with fine bubbles, then giving way to fruity traces of peach and pear flowers.